My husband loves to fish – I remember when I first met him, we would go to a different lake every weekend for him to fish with his friends. Fishing for him is a time to unwind, relax and reconnect with his surroundings. 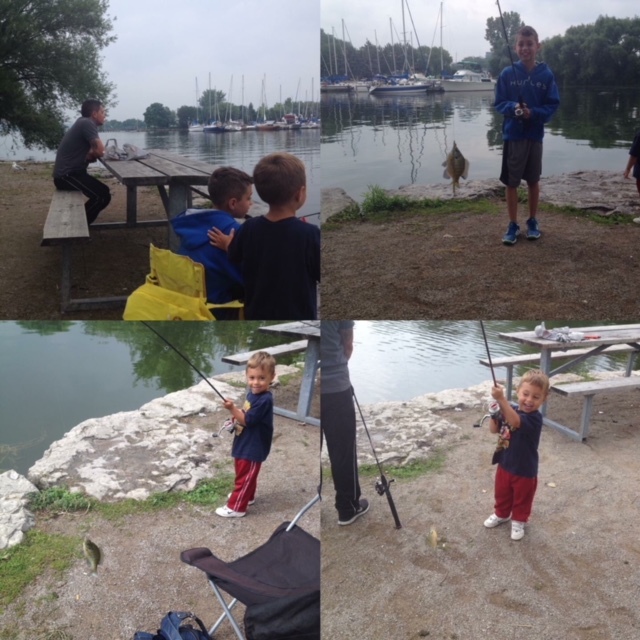 When our boys came along, I am sure he worried that he wouldn’t be able to have this time anymore but just like their Dad – they LOVE to fish! Just don’t ask them to put a worm on the hook or take a fish off the line (in this they are more like me). While fishing can be a lot of fun, it does require a bit of skill that can be difficult for novice fishers and those who just want to fish for recreation. The hardest part I found for kids (and me too) is the casting. It can be difficult for children to accurately hold and cast a line out and you don’t want them so frustrated that they give up. Many of us look for a child friendly alternative that encourages them to learn the basic skills but is also easy and fun for them to use. The Rocketing Fishing Rod replaces the standard fishing pole and can accurately cast a line up to twenty five feet. It has a safety bobber that keeps the hook enclosed until it hits the water which I am sure many parents have been terrified of their child getting hurt with the hook. When that component hits the water, it opens to drop the bait to the correct depth. Awesome, right? The rod itself is quite light and fits easily into the palm of your child’s hand. While lightweight, the rod itself is definitely sturdy enough for fishing for your child – so no need to worry about it breaking on you. Our son found it easy to pull back and “load” the rod (very similar to many of his toy shooting guns) and then release the bobber. It takes away all of the stress and frustration of casting because lets face it, that is one of the hardest aspects of fishing for children (and this Mom too!). The best feature is how safe the rod is – your child will not come in contact with the hook. The hook is safely housed within the bobber and is released only once casted into the water. You do not have to worry that they will get cut or that curious minds may try to play with the hook. 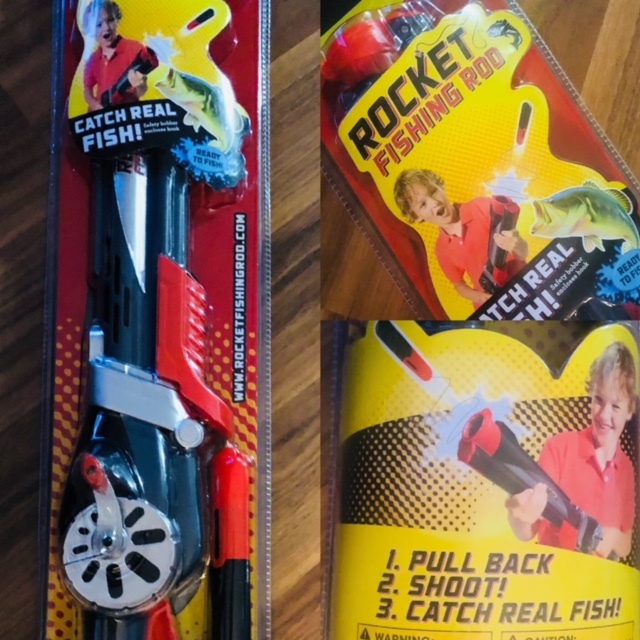 The Rocket Fishing Rod is one of the safest and child friendly fishing rods I have ever seen. It takes away the frustration, confusion and makes fishing fun for young children. Do you have an avid fisher in the making in your house or maybe you want to bond over fishing with your young child – then head over to Amazon today to purchase one (it would make a great gift for the holiday season!). Learn more about the Rocket Fishing Rod on the Goliath website here. Make sure to follow Goliath on Facebook and Twitter to keep up to date with the newest products, toys and more. This brings back so many memories of my first junior fishing rod back in the 70’s. I caught so many fish with it!!! my husband is a huge fishing guy too! I think he can’t wait to teach our son! Goliath makes a lot of great games and toys. This fishing rod sounds perfect for my own little boy. Denise C recently posted…The Ben 10 Alien Creation Chamber: Create Your Own Mini Action Figures! What a nice rod to start off with for the junior fishers. Embrace them as fishing is a patient game which most of the people would find it boring.